Is your design complicated and you’re looking for a cost effective but reliable sealing solution? Do you need an effective seal for smaller designs or tight spaces? Is highly-skilled, time intensive assembly a consideration? Have you thought about Form-In-Place (FIP) Gaskets, but don’t know if they are the correct choice for your project? 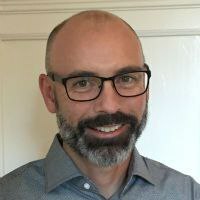 If you are the engineer charged with solving design challenges, then Form-In-Place Gaskets just might provide the answer you seek. So what exactly are Form-In-Place Gaskets and when would they be most beneficial? 1. What exactly are Form-In-Place Gaskets? The Form-In-Place gasket manufacturing process originated in the automotive industry as a less-costly alternative to traditional gaskets that were die-cut, molded or extruded. Because of the advancements made over the years, this process is now widely used and trusted in high-tolerance applications in aerospace, medical, telecommunications and military equipment. FIP gaskets are typically produced on automated dispensing machines. The electrically conductive silicone or traditional silicone gasket materials are forced through a needle and dispensed on a housing or RF shield surface. Probably the easiest way to picture the process is to imagine a CNC controlled caulking gun. Okay, now imagine the caulking gun is affixed to $150,000 dispensing machine! During the last couple of decades, tremendous improvements have been made to both the materials and equipment used to manufacturer FIP gaskets. Form-in-Place (FIP) gaskets have become a cost-effective alternative to conventional die cut or molded gaskets. They also provide the reliability, precision and endurance required for an effective environmental and EMI shielding seal. In contrast to die cut gaskets with a PSA backing, FIP gaskets are vulcanized directly to the workpiece. The housing or RF shield is typically placed on the dispensing table and the silicone is deposited directly on the piece. The silicone is then vulcanized via thermal cure, RTV or UV cure. There are many advantages to vulcanizing directly to the surface, but of course cost reduction via the elimination of PSA is probably the biggest advantage. The FIP gasket process dispenses silicone directly onto metal or plastic surfaces. The process allows for changes in elevation, uneven surfaces and thin profiles. With gasket shelf probing and other sensing technology, FIP can be a perfect solution for less-than-perfect molded housings and as-cast metal shields. 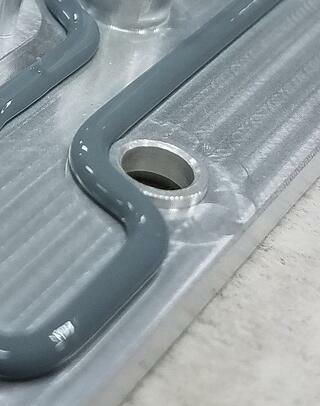 Probing the gasket shelf prior to dispensing can mean cost savings in the form of less machining and housing rejects. A valuable benefit of Form-In-Place gaskets is its inherent ability to place the thinnest possible bead within the very smallest cross sections. This means FIP technology supports densely populated electronics packaging, especially when inter-compartmental clearance or isolation is necessary. FIP gaskets utilize a robotic system which ensures repeatability and accuracy regardless of the size of your production run. This process allows the gasket path to conform to complex and intricate designs while maintaining tight tolerances. FIP eliminates the need for a mold, thereby reducing upfront costs and reducing lead times. Inventory costs are reduced as there is no need to maintain stock of pre-manufactured gaskets. Automated dispensing reduces manual assembly labor costs and supports high-volume production. FIP is an ideal solution for quick-turn prototyping. 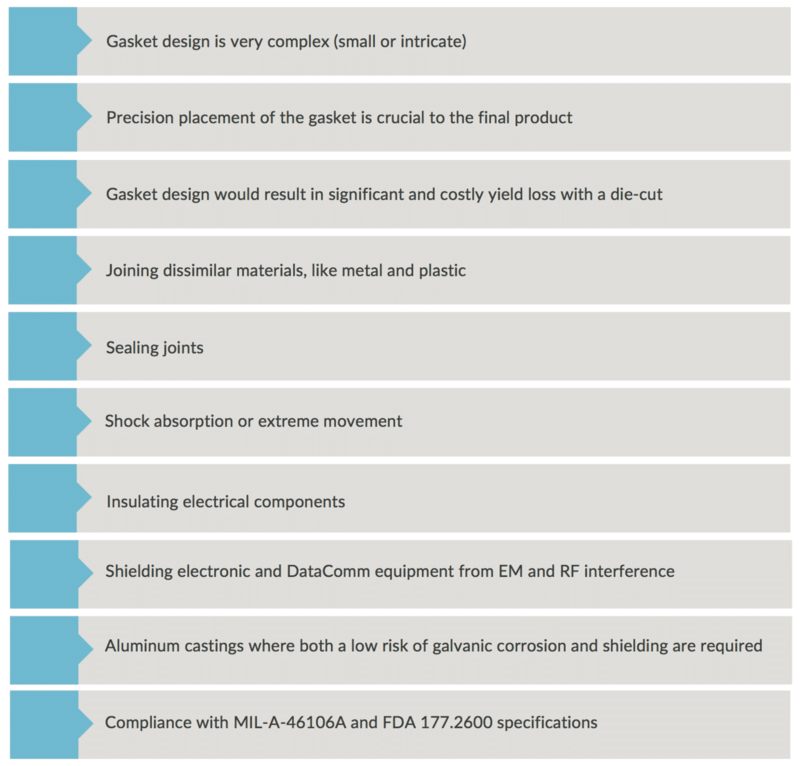 Changes to the gasket design can be made immediately, shortening production design cycles. Traditional compression gaskets and O-rings are pre-formed to design specifications. They are molded, die cut, or extruded separately from the housings they are designed to seal. Form-In-Place Gaskets are dispensed directly onto the workpiece as a one or two-part seal, then cured. Both are viable and reliable options; however, one may outweigh the other depending on your specific application. 3. What materials can be used? With advancements in technology, there are now a vast array of materials available for Form-In-Place gaskets. Many materials exhibit excellent shielding effectiveness, superior adhesion, heat and humidity resistance, and low-compression set characteristics. Engineers often seek silicone compounds, both non-conductive and conductive, because of their multiple benefits. Typically resist corrosion and tolerate extremes of moisture, UV and ozone found in outdoor applications. Include silicone compounds with conductive fillers such as silver, copper and nickel-graphite. Can combine limited environmental protection with EMI shielding properties. Why choose Form-In-Place for your project? 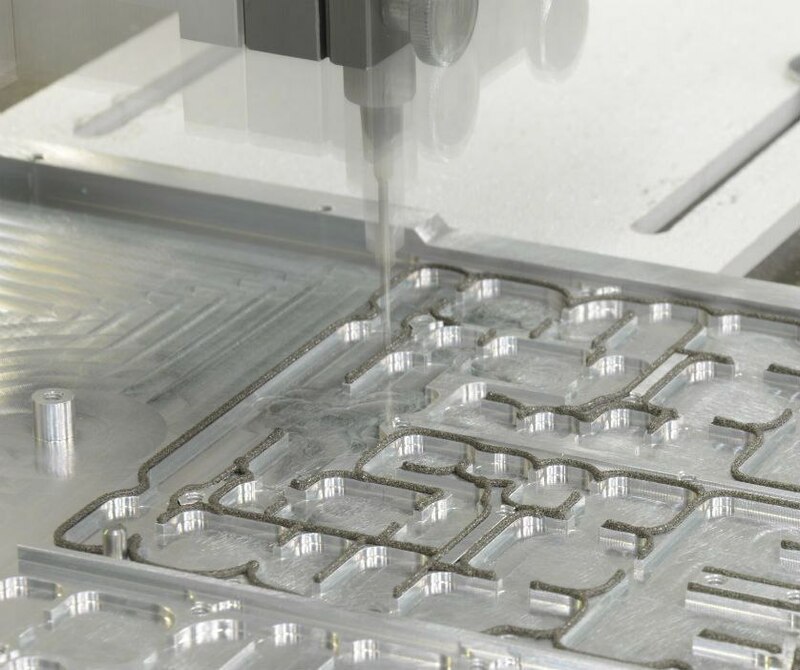 Form-in-place gasket manufacturing lends itself to both quick-turn prototyping and high-volume production of complex parts. 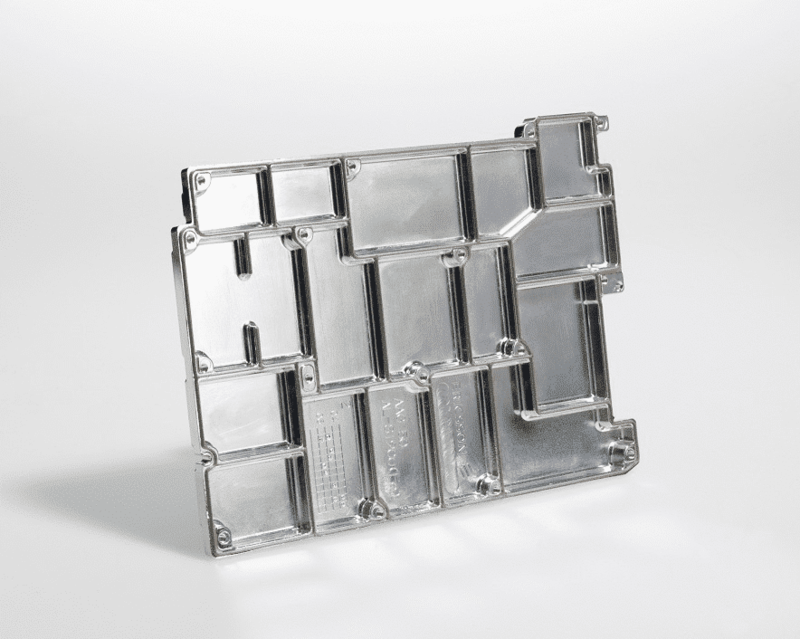 Form-in-Place is ideal for both intricate and small compartmentalized shielding. Automation and the lack of molding allows for short lead times and fast adjustments. Automation also reduces labor and materials cost and overall gasket dimensions. Mold-free robotic dispensing increases precision and versatility. The variety of materials available allows FIP to provide effective environmental, EMI, or RF shielding. So, is cost a concern? Do you have a complicated design requiring a precision solution? Are you against the wall with regard to lead time? These are just some of the issues that may easily be solved by Form-In-Place gaskets. Providing the lowest total material cost for complex pattern applications, Form-In-Place gaskets are a solid and viable option for consideration. The Modus Advanced, Inc. Team is continually working to stay abreast of the very latest innovations in materials, processes and products. Our end goal is to keep our customers informed about what’s tried-and-true, in addition to the many emerging technologies. Pooling the team’s knowledge, experience and skills, we endeavor to produce valuable, relevant and accurate content to help our customers become aware of problems/opportunities; available options; and potential solutions. Team Modus™ - Using our 40 years of custom manufacturing experience solving real problems for you, our customers!